PLNDR is currently having a Hellz Bellz x Married to the MOB sale that offers FREE SHIPPING on you entire purchase with the purchase of two shirts from the sale. Isn’t that awesome? 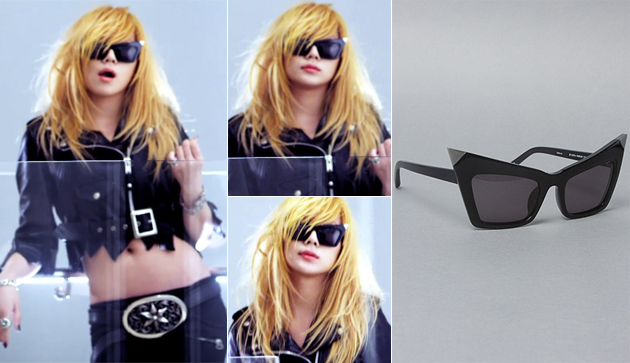 Perfect time to stock up on all the Hellz tees you’ve seen 2NE1 over the years! Enter the sale here and be sure to use code HELLZMOB at checkout to redeem the offer! Look at what I just spotted on PLNDR! 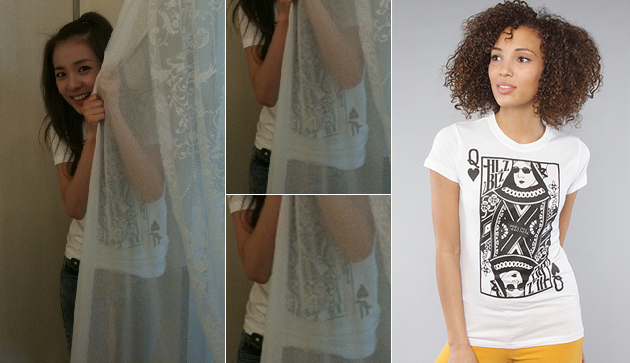 The Queen of Hearts tee from Hellz Bellz. 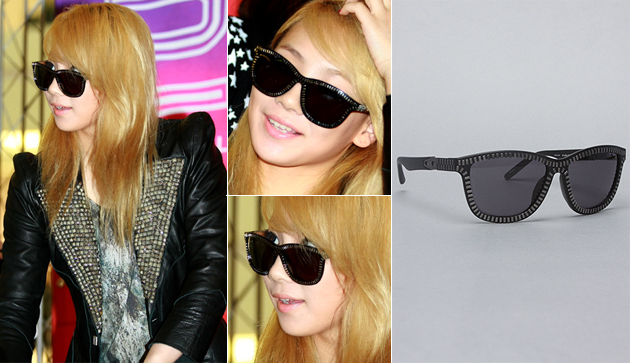 Remeber when 2NE1‘s Dara wore this tee back in 2010 for a Me2day update? I’m sure you do! Well, if you weren’t able to get the tee then, now is your chance. PLNDR currently has the tee on sale at 41% off for just $18.99! In order to access this sale and more you have to become a member here. In addition to the sale, you can save 10% off each item from your PLNDR order with repcode: Kstyle. On February 29th, Me2day Queen Dara, updated her account with a photo of herself posing with a “V” sign and an adorable dog. 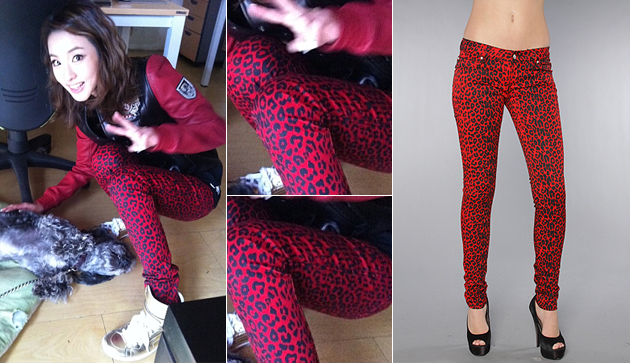 In the photo she is seen wearing the Skinny Stretch Twill Pant Red and Black Leopard from Tripp NYC. Luckily for fans, the jeans are currently on sale at 50% for just $32.95 at Karmaloop. For additional savings be sure to use repcode: Kstyle for up to 20% off your entire purchase. Get 2NE1’s Park Bom’s Baleciaga Boots look for less! Like most fans,while watching 2NE1‘s UGLY music video last summer, I couldn’t help but drool over Park Bom’s Balenciaga cut out boots. I wanted to get my hands on them immediately, but there was a slight problem-they retailed for $1,300.00. 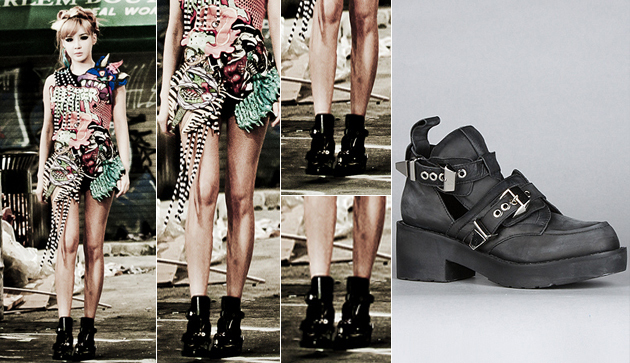 Luckily, I came across the Jeffrey Campbell Coltrane Boot, an alternative that retails for just $190.00 at Karmaloop! Like the Balenciaga cut out boot, it features cut out details and large metal buckles. It seems like the only difference is the price tag! For additional savings, be sure to enter repcode: Kstyle at the checkout for up to 20% off your entire Karmaloop order. 2011 Best New Band in the World re-cap and more! As you may have heard, on December 12th, 2NE1, who was announced MTV Iggy’s Best New Band of 2011, performed at MTV studio in Times Square. Several weeks ago, MTV Iggy held an online contest to give New York fans a chance to see the girls perform live. There was a limit on how many people could win and for the first time I won something. The ticket admitted me and one guest so I brought along one of my friends this time. Around 12:30PM we met up and made our way to Time Square to wait on line. I just came from taking a final so by the time I got there the line covered 7th avenue and reached all the way down to 8th! Though, the line was extremely organized and time went by pretty fast. Before I knew it I was getting my wrist band and entering the building around 3:00PM. So! Around 6:00PM the ladies of the night came out and everyone went crazy at the sound of their debut song, Fire. Let me first just say that they are gorgeous-seriously. (They definitely melted a lot of hearts that night.) The girls then performed Can’t Nobody , Lonely and finally I Am the Best. It was great to see them live, after watching them on Youtube for years, it was great to see them up and close. 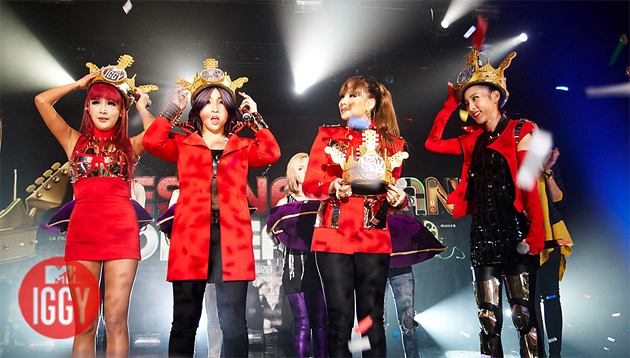 At the end the girls were finally crowned by selected fans (above photo) as MTV Iggy’s 2011 Best New Band in the World. After so many hours of standing IN THE NEW YORK COLD, being shoved, listeing to annoying fans, getting elbowed on the head and getting into an argument…I can say it was worth it. It was a great night!